Promotional Greenwich laptop bag makes a generous and practical gift with a high visible print area and can be printed full colour. 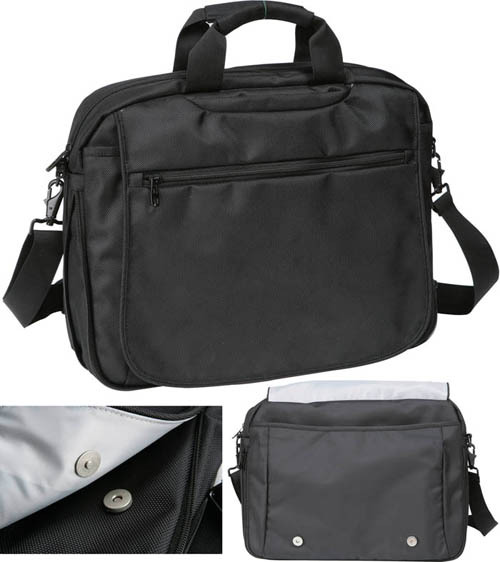 This Promotional laptop bag comes with zipped front pocket, zipped extendable main compartment, organiser section, neoprene handles, metal accessories, and a shoulder strap. The promotional Greenwich laptop bag is not just a great promotional tool these promotional laptop bags are not just designed to carry laptops in a safe way they have pockets designed for pens, pads, a mouse, a mobile phone, folders and many more items. The Greenwich laptop bag can also be used as free giveaways at corporate trade shows and events. The Greenwich laptop bag is only available in black and made from 1680d polyester. Promotional cotton bags which are versatile promotional items that can be used for multiple purposes; as a shopping bag, and for day to day use, to carry your laptop, for food shopping, as a baby changing bag, and much more. Promotional cotton bags have large promotional print areas and can be printed on either side or on both sides. You can have a full colour transfer or a simple one colour print depending on the effect you wish to achieve when promoting your campaign or marketing message. Promotional Jute bags are a very popular promotional gift. Promotional jute bags come in all different sizes for different purposes. The promotional Jute bag is made from Hessian material which Hessian fabric is weaved together to create a thick, strong and long lasting promotional bag. Also there are drawstring bags which are all reusable and long lasting. Large or small, drawstring bags have a wide variety of uses. Shoe bags, dust bags, gym sacks, laundry bags, eco-jute drawstring bags for seeds, shiny sateen jeweler bags - the possibilities seem endless with a variety of different materials -from smooth white polyester fiber, to pretty sateen ribbons. Promotional Drawstring bags can be printed or embroider depending on the type of bag. Promotional drawstring bags come in a variety of different colours which have generous print areas. Lancewich have many more types of promotional bags and gifts please do not hesitate to call to find out more.